Why doesn't Apache start up automatically? 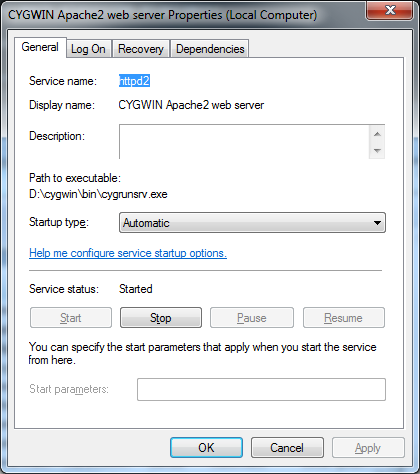 I have Apache2 running on Cygwin on my Windows 7 computer. It doesn't do much, it just hosts some HTML documentation for my local (firewalled) LAN. Oddly, it doesn't seem to start automatically even though its Startup type is automatic. However, when I start it manually, it works perfectly. Any idea why this might be? The description for Event ID 0 from source httpd2 cannot be found. Either the component that raises this event is not installed on your local computer or the installation is corrupted. You can install or repair the component on the local computer. [Fri Jul 17 08:30:29 2015] [warn] pid file /var/run/apache2/httpd2.pid overwritten -- Unclean shutdown of previous Apache run? Above command will tell you the exact error that you might have in your configuration file with line number. I've stumbled upon similar issue. Make sure that executables do not have a warning in their properties "This file came from another computer...". If this is the case, refer to "This file came from another computer..." - how can I unblock all the files in a folder without having to unblock them individually? Not the answer you're looking for? 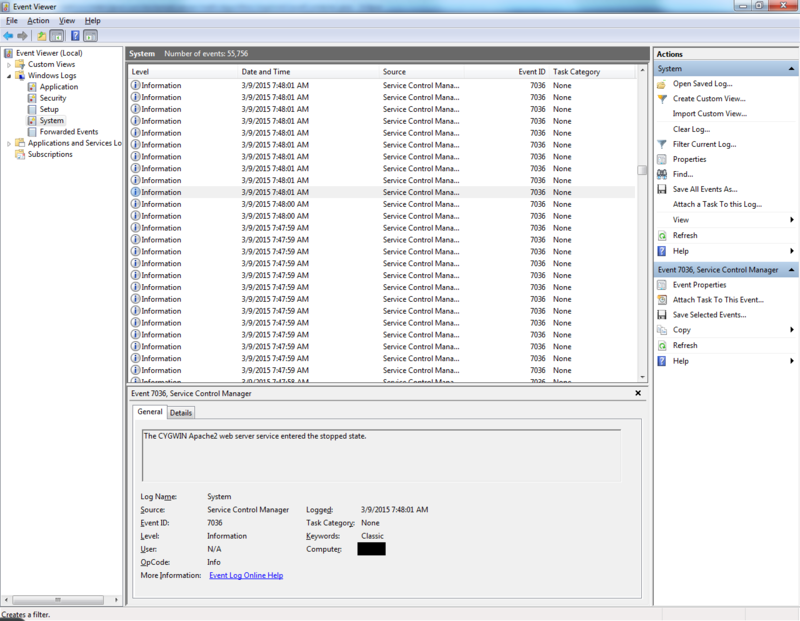 Browse other questions tagged windows-7 apache-http-server cygwin services or ask your own question. “This file came from another computer…” - how can I unblock all the files in a folder without having to unblock them individually? Why is Xampp unable to start Apache? Why apache doesn't restart after configuring SSL? Why doesn't Apache start in MAMP?